There’s something that I love about this pic, crumpled paper towel and slouchy posture aside. I had no idea that Dave snapped it while I was typing away last Saturday and I think it’s neat that you can’t see my face. 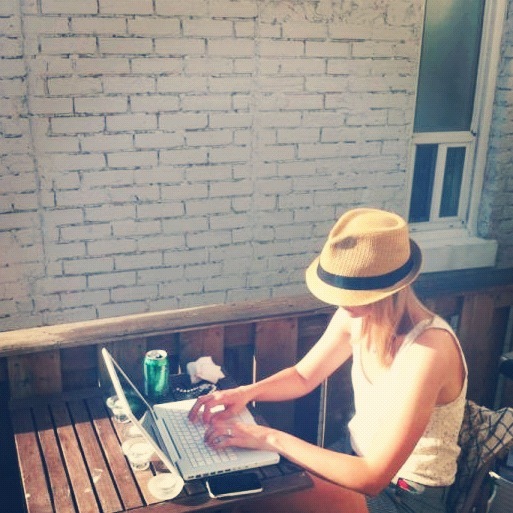 It also inspires dreams of turning our balcony into an outdoor office. I actually work in a really nice office: it’s open concept with lots of natural light, hardwood floors and a cool lofty feeling, thanks to a high ceiling and exposed beams. But, my ideal office space at this time of year, when the air is warm, but not too sticky, is our balcony. It’s tiny, sure, but it’s got sweet features, like fragrant herbs and full afternoon sun and a barbecue where I could grill up some chicken burgers and veggies for my lunch. It’s also close to the fridge, where you can usually find a cold beer or two. Anyway. A girl can dream, right?! This entry was posted in Uncategorized and tagged balcony, barbecue, bbq, chicken burgers, crumpled paper, exposed beams, food, fragrant herbs, high ceiling, loft, nature, office, outdoor office, patio, travel, work by lovewritenow. Bookmark the permalink. I have tried using my device on the patio/outside but can never really see the screen because of the brightness overall of the sun. What is your trick? Glad you are making the most out of your balcony. Cool! That happens to me sometimes too – darn glare! A hat with an extra-wide brim could help, even thought it would look ridiculous!